You will be picked up by your at 9am from your centrally located hotel in Tokyo and get to Tsukiji by subway. "Tsukiji," which means reclaimed land, was built around 360 years ago. Tsukiji is separated into two main areas: the Inner Market (Jonai Shijo) and the Outer Market (Jogai Shijo). At the world-famous Tsukiji Fish Market, you will taste some fresh sashimi for breakfast. 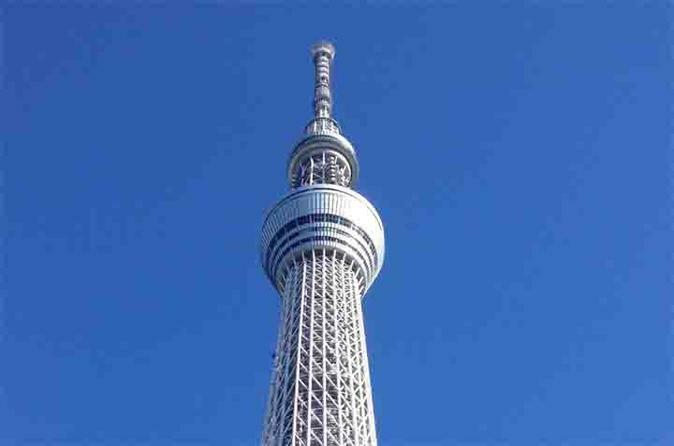 Afterward, you will head to the Tokyo Skytree that stretches 634 meters high. This self-standing tower, used for broadcasting, was built in 2012 and you can look around all of Metropolitan Tokyo as well as as far away as Mt Fuji-san when it is clear. Here, you will have the best view of the city as a whole. Then at Asakusa, you will stroll the streets near the Old Buddhist temple, Sensoji, with the Nakamise street shopping which was established in the 7th century. The Nakamise street is a famous shopping street in Tokyo. Thereafter, you will have the chance to stroll through in the garden of Imperial Palace, the ruins of the Edo Castle built by Ieyasu Tokugawa and where current Emperor resides. Then you will venture off to Ginza to explore the upscale Ginza flagships of designer brands. Ginza is a famous, upscale shopping area. After seeing the Ginza area, you will be taken back to your hotel in Tokyo at around 3pm.